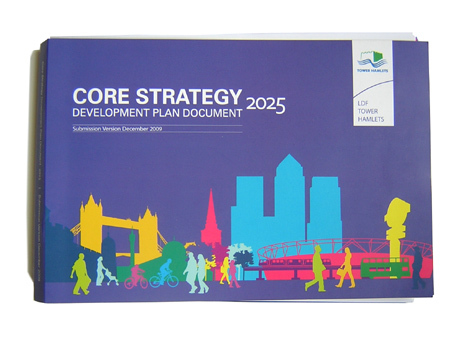 The Core Strategy sets out the over-arching plans for how and where development will happen in the Borough. All other policies follow from the Core Strategy – this is why it is important yet there has been little effort to explain what it is and the impact it could have. Public consultation was in October and November and the Strategy was approved at a Full Council meeting in December. Now there will be an independent examination by a planning inspector who will test whether the Core Strategy is ‘sound’ (see The Hearings, left) . The council will have to justify its policies at the Hearings. The Core Strategy becomes law when it has been approved by the inspector and the Secretary of State. This is the highest target in London – 13% of all new housing is going to Tower Hamlets. The targets are set by the GLA. Tower Hamlets covers 8 sq miles and the current population is 215,000 and would rise by at least 80,000. New housing will be distributed across all neighbourhoods (see p40, diagram, p46, figures). The Core Strategy says the main role of Tower Hamlets’ is to serve London’s financial and business sector, providing the land for development. (Strategic Objective 01, p28) This prosperity is meant to ‘filter down’ to benefit the poorer local areas (p24). The ‘worker population’ is planned to expand by more than 100,000. Neighbourhoods next to the City and in Canary Wharf will be re-classed as ‘Activity Areas’ where their residential character will have to mix with offices, bars, restaurants, hotels and other central London-type uses. Large floorplate offices in Aldgate, Bishopsgate, Tower Gateway and Canary Wharf. These are Aldgate, Spitalfields, Shoreditch, Bethnal Green, Whitechapel. Wapping, Tower of London, Shadwell, Stepney, Globe Town, Bow, Victoria Park, Fish Island, Mile End, Bow Common, Bromley by Bow, Limehouse, Poplar, Poplar Riverside, Blackwall and Leamouth, Canary Wharf, Cubitt Town and Millwall. 41,000 sq m of further RETAIL SPACE will be encouraged across 11 different areas (p37). AFFORDABLE HOUSING targets are 35% – 50% required in all new developments over 10 units (nb 50% is almost never achieved). 70% of this must be social rented housing and of that 45% family housing. Family housing (ie 3 beds or over) should occupy 30% of all new private and ‘intermediate’ developments over 10 units. The main concern is that the development of massive amounts of housing, office and retail development will push out the other priorities such as the provision of green space; provision of affordable and family housing; safeguarding local shops and small businesses; dealing with poverty; the upkeep of historic areas; concerns about the environment, including carbon emissions and flood risk. Having the developers’ agenda as the main priority will result in an overcrowded, socially divided and unhealthy place to live and work in (these concerns are reflected in external assessments of the plan, like the Equalities Impact Assessment and the Sustainability Appraisal). This is against the principles of the ‘Statement of Community Involvement’, which promises to inform and include residents in planning decisions. Participation is vital for a major scale of change such as the Core Strategy and in areas with diverse communities. Only 400 residents (out of 210,000 in the borough) were invited to take part in discussions on new ‘Town Centres’ in April. Since then, four new ‘District Town Centres’ have been added (Roman Road West, Watney Market, Brick Lane and Bromley by Bow) and six new ‘neighbourhood centres’ (Ben Johnson Road, Manchester Road, Stroudley Walk, Cambridge Heath, Stepney Green and Salmon Lane) and not all have been discussed by residents. The ‘Strategic Objectives’ are not yet linked to detailed policies or the map of specific sites – we don’t know where the new housing, offices and shops will go so we can’t tell whether the plan would be viable in practice. The GLA’s target of 13% of all the housing needed in London (43,000 units by 2025) is too high for this small borough to deal with and should be reduced. There are no clear ideas to justify how this large-scale building strategy will deliberately tackle the extremes of wealth and deprivation in the borough (described on p31) and avoid creating a divided and unhealthy place to live and work in. There are no alternatives to Tower Hamlets’ role as both serving and relying on the financial services sector (SO1 page28), given the effects of the economic crash. There is increased uncertainty around the residential property market and the economy in general. There is no secure plan to deliver the infrastructure needed to support the planned incoming population and further development (eg schools, doctors, waste management, water). Even now, some primary school children have to go to schools that are far away from their homes because of lack of spaces. A policy to champion local employment, local business and the local economy should be added to the policies for a ‘sustainable’ borough (SO3) and to the policies for ‘Enabling Prosperous Communities’ (Chapter 5). This is to balance the further ‘Tesco-isation’ – superstore takeover – of the borough. It is not clear how those who live and work in the area will benefit from new development and not be adversely affected by it, e.g. through displacement associated with regeneration and issues around health inequality (Town Centre policies SO5 and 6). Local employment and businesses should be a priority in these centres, as above. The definitions of a ‘neighbourhood centre’ or ‘district centre’, and what they will and will not permit as new development, have not been provided. New classifications might alter the suitability of an area for families, with higher densities and less open space and access to facilities. This leaves fewer areas suitable for families and causes places to be less healthy and mixed. The minimum requirement for ‘open space’ is 1.2 hectares per 1000 people but this target cannot be met (see page 54). If this amount of space were provided for the 80,000 new residents it would mean a space as big as Victoria Park and Mile End Park combined. ‘Green chains’ and ‘access to green space’ will serve to provide the target. We suggest that all current open and green space should be listed and retained, to prevent the continual encroachment of development into these much-needed spaces. There is no policy for tall buildings to show how and where they could be built, no clues about what the new ‘town centres’ would look like and whether anti-social tall buildings will be controlled. High targets set for house-building are not matched by high targets in other departments. These are some of the other targets: one new park per year (it does not specify where or what size); 1% increase in cycle and footpaths per year; satisfaction with the built environment 10%; 80 enrolments on adult education courses per year (figures taken from monitoring targets in the appendices pages 139-148). The level of development, if carried out, would be environmentally unsound and cannot be justified by ‘mitigating’ effects. London’s buildings already cause 60% of carbon emissions and in Tower Hamlets the commercial and industrial sector account for 65% of the borough’s emissions (Sustainability Appraisal p35) and there are no targets to force cuts in business emissions. The energy used for further large-scale construction does not appear to have been included in carbon emissions. Large parts of the borough are in ‘high risk’ Flood Zone 3 (Poplar, Poplar Riverside, Leamouth, Blackwall, Canary Wharf, Millwall, Cubitt Town) yet this is where large-scale development is planned (Sustainability Appraisal p106). The re-classification of Spitalfields, Shoreditch, Aldgate, Whitechapel and Bethnal Green as ‘City Fringe Activity Areas’ means that there would be no distinct policy to prevent the large-scale takeover of commercial business in these areas (including further ‘night-time economy’ uses) and the compromising of them as residential amenity areas. They also have a character of small business provision, low-rise architecture, often historic architecture and numbers of social housing estates. There needs to be a number of distinct policies for the protection of these areas – or the scrapping of this classification altogether. The City’s demand for more office space in these areas is not sufficiently justified. There is already over-provision of offices and less is needed in the City Fringe than in the City of London and Canary Wharf.